Home to some of India’s most glorious and least visited architectural treasures, northern Karnataka and the Deccan was once ruled over by mighty Hindu kingdoms and a succession of powerful Muslim sultanates; which in their pursuit of artistic immortality, have bequeathed us with a plethora of exquisite temples, glorious palaces, mighty fortresses and striking onion-domed mausoleums that, collectively, reflect the high-water mark of Dravidian art. Hampi & The Deccan Sultanates is a private chauffeur driven tour that has been designed to showcase these magnificent and exceptionally rewarding off the beaten track monuments – but in doing so - the visitor must be aware that it will be necessary to compromise on the standard of accommodation in places. Starting in Bangalore, explore the summer palace of Tipu Sultan – the Tiger of Mysore, then travel via the intricate Hoysala temples of Belur and Halebid to the spectacular 14th century Vijayanagara ruins of the imperial city of Hampi. Next, proceed to the magnificent temples at Badami, Aihole and Pattadakal, then discover the celebrated mosques, imposing forts and splendid palaces at Bijapur, Bidar and Gulbarga, before arriving in the stunning city of Hyderabad with its magnificent Indo-Islamic architecture and bustling pearl market. 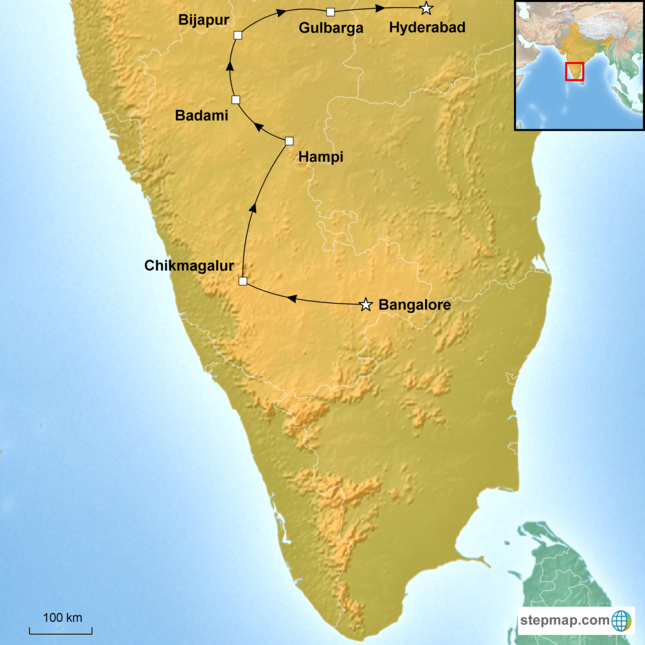 This tour of Hampi and The Deccan Sultanates is one of India’s great journeys. Day 3 Tour of Belur and Halebid. Day 11 Golconda Fortress, Qutb Shahi Tombs. Afternoon at leisure. Day 12 White Mughals of Hyderabad. Day 13 Morning tour of Old Hyderabad. Afternoon at leisure. Day 14 Farewell to India. Arrive Bangalore Airport. Afternoon tour Tipu Sultan’s Summer Palace. Climb to the summit of Vindhyagiri. Arrive Chikmagalur. Tour of Belur and Halebid. Visit Aihole, Pattadakal. Arrive Bijapur. Morning tour of Bijapur. Arrive Gulbarga. Explore Gulbarga. Drive to Hyderabad via Bidar. Golconda Fortress, Qutb Shahi Tombs. Afternoon at leisure. Morning tour of Old Hyderabad. Afternoon at leisure. Explore the summer palace of Tipu Sultan – the Tiger of Mysore. Gaze on the colossal 10th century Gomateshwara monolithic statue. Marvel at the exquisite stone sculptures at Belur and Halebid. Admire the historic ruins of the 14th century Vijayanagara Empire at Hampi. Visit the magnificent Chalukyan era temples at Badami, Aihole and Pattadakal. Discover the Indo-Islamic architecture of Bidar, Bijapur and Gulbarga. Explore Golconda fortress, synonymous with diamonds. Stroll through the bustling markets in Old Hyderabad. Enjoy a full-day tour inspired by William Dalrymple’s White Mughals. 3 nights: Relax in Dubai.